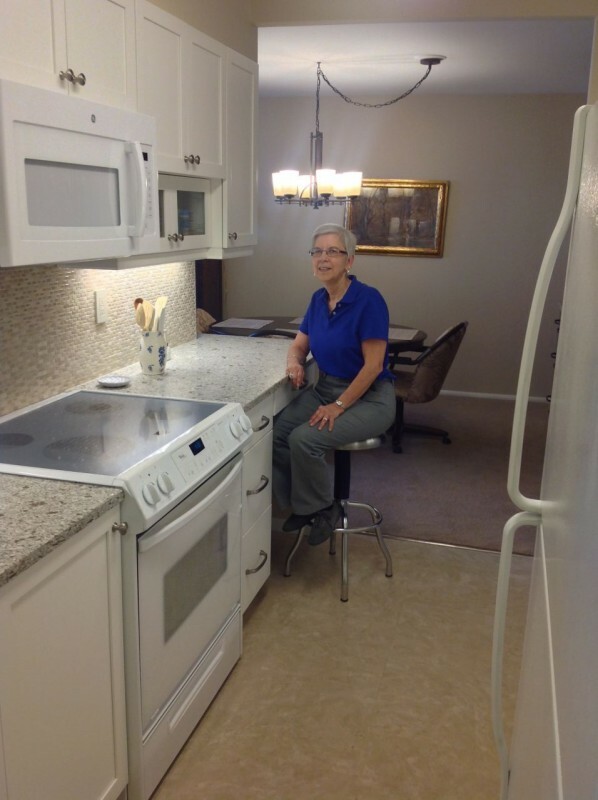 When Karen Hruska of Lakewood Ohio decided to remodel 4 rooms (the kitchen, dining room, master and guest bathrooms) in her 15th floor condo she knew it was not going to be a small task. While Karen’s careful planning and thoughtful selection of a contractor (she selected Cleveland Design and Remodeling) were important the successful completion of this project also required a healthy dose of the 3 I’s of high rise remodeling – ingenuity, improvisation and inspiration. 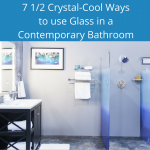 In the article below I hope you enjoy and learn from the insights and strategies Karen and the Cleveland Design and Remodeling construction team used to create an upgraded and more functional space. Adding on space is not an option in a condo because you’re confined to the 4 perimeter walls of your unit – so making the space work better is essential. 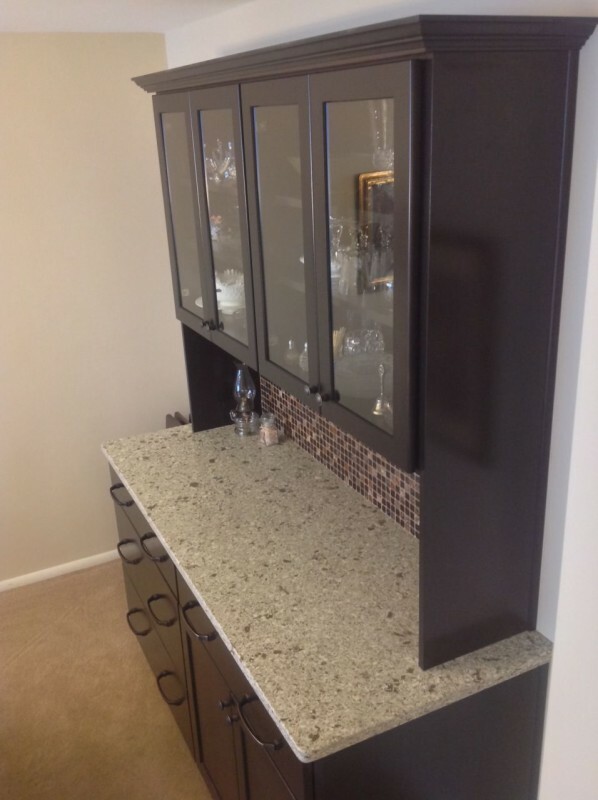 Let’s look at the collaborative ingenuity Karen, Jeff Merrell and John Fronek (of the Cleveland Design and Remodeling) used to improve the function of her galley style kitchen and master bathroom. o Open it up – A wall separating the dining room and kitchen was removed to open up the floor plan and bring more natural light into the kitchen. 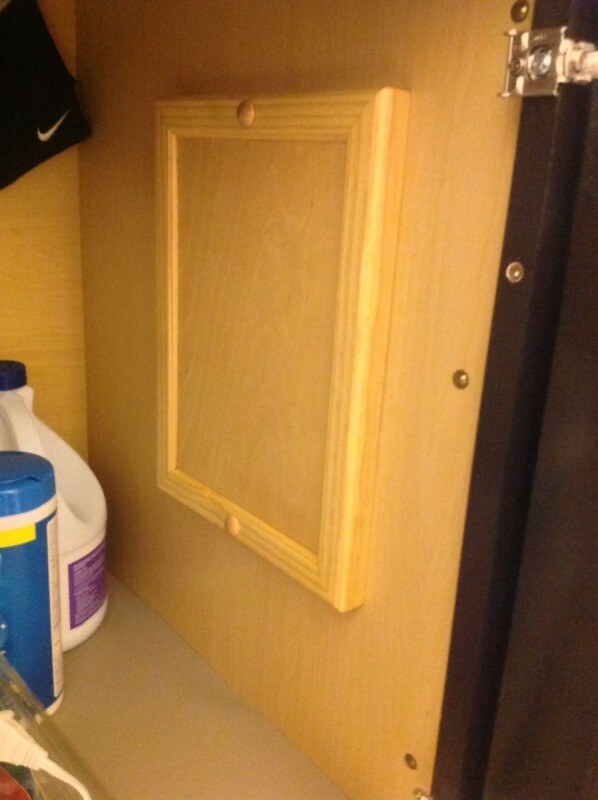 o Don’t reach in, pull out – The new pull out drawers make finding things easier and it’s less physically stressful for Karen than having to bend over and reach into the cabinets to find things. o Have a “slash” area – A “slash area” is a multi-purpose space where you do a little bit of this and a little bit of that. 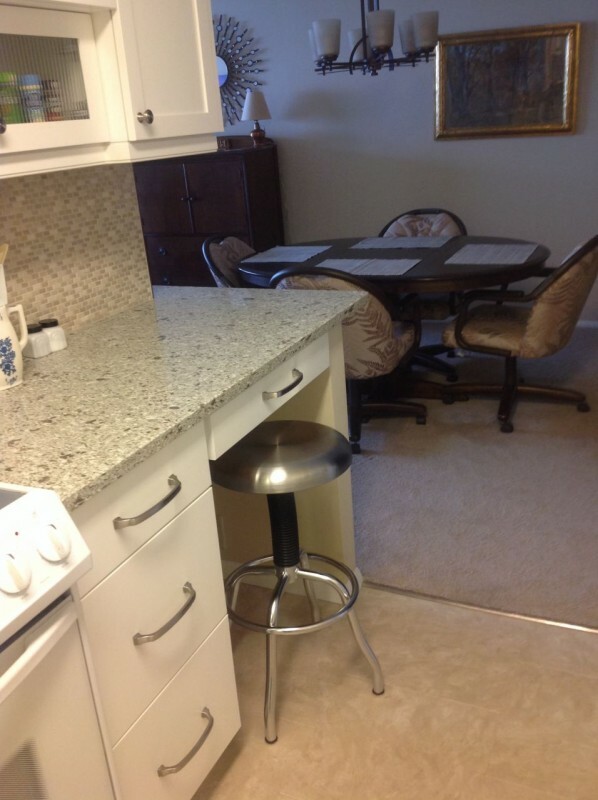 At the end of the galley kitchen a desk area was built which also serves as an eat-in kitchen area as well. o Improved lighting – any time of day – Using a mixture of overhead and under cabinet lighting and dimmer switches allows lighting to be varied for any time of day or mood desired. o Increased counter space – An underutilized utility cabinet in the old design was removed and replaced with a longer kitchen counter. o Get rid of the “low-boy” – Is the toilet in the original bathroom the shortest thing you’ve ever seen? A standard height toilet was installed which is easier to sit down and get up from. o Heavy sliding “mirror-mirror” is no longer on the wall – As Karen said to me, “I used to have to reach over a very deep bathroom counter to open up extremely heavy sliding mirrors. They were so difficult to open I usually kept them open.” These mirrors were replaced with an easy to open hinged medicine cabinet. When you’re doing a remodeling project on the 15th floor of an older luxury waterfront high-rise you need a bit more craftsmanship and creativity than in a newer single family home. I’ve highlighted below some hidden construction features and a funny improvisational necessity which was important for a time-effective completion of this project. • A “Johniee Special” – make it nice even if it’s not seen – You know a craftsman when they care as much about what is not visible as what is visible. Check out the custom carpentry around the access panel inside the bathroom cabinet . John (aka “Johniee”) Fronek (the Project Manager) is a bit of a quality fanatic who will do quality touches most people will never see. • The traveling slop sink – Since there was no place on the 15th floor to clean tools, brushes etc. 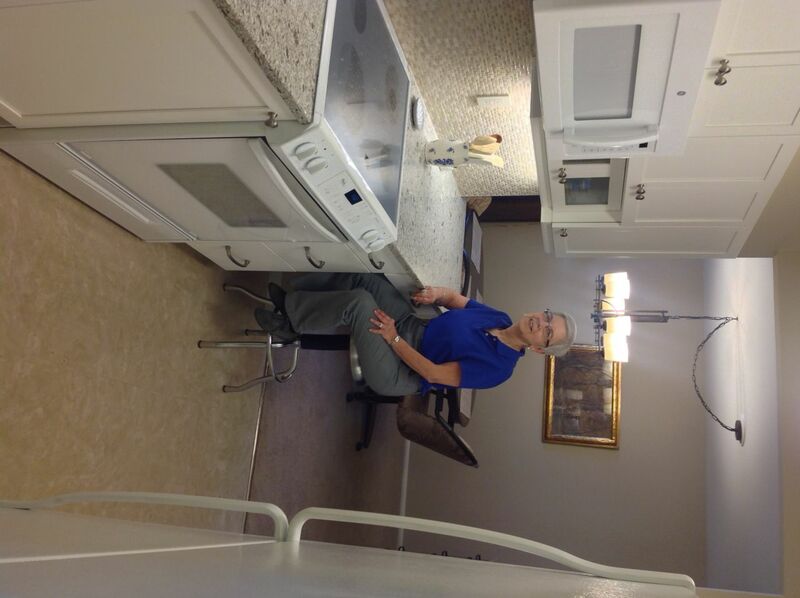 Karen had the distinct pleasure of having a slop sink with a “custom” cardboard backsplash installed in her kitchen (and then moved to the guest bathroom) to ensure clean-up was efficient. How cool is that! 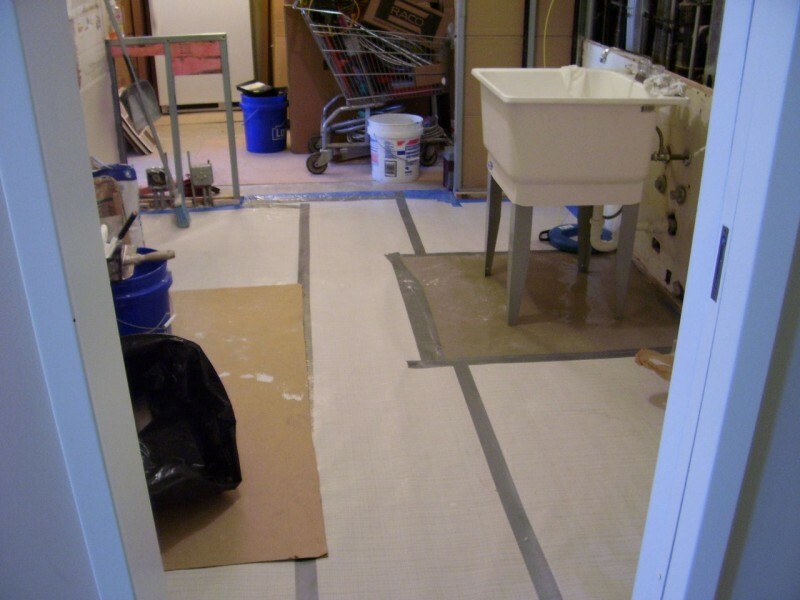 Who really likes slop sinks in the middle of their home under construction or the remodeling process in general? Probably no one. Things get fun and inspirational when the remodeling is done and you can sit back and relax in the finished rooms and enjoy the new space. Let’s look at a couple of distinctive products and finish treatments in Karen’s project. 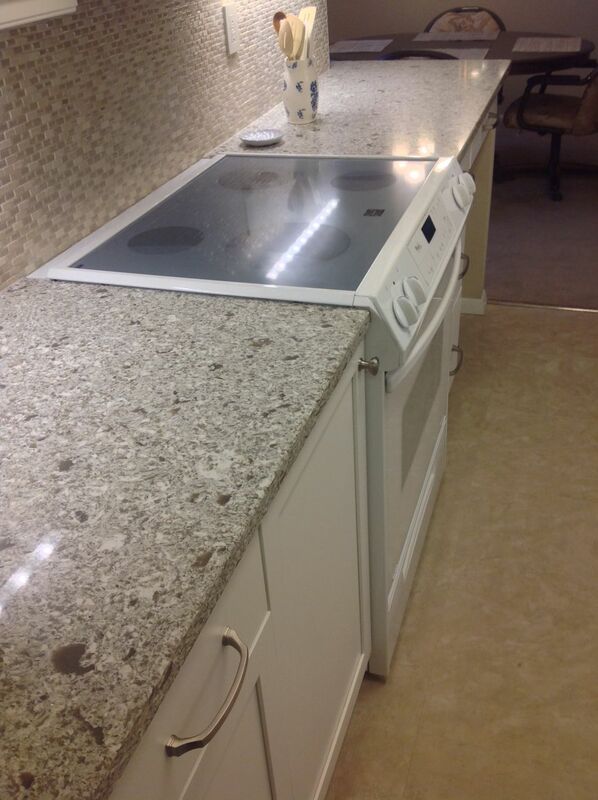 • Quartz countertops – Watching the flecks of silver visually pop from the Granex countertops is very enjoyable. 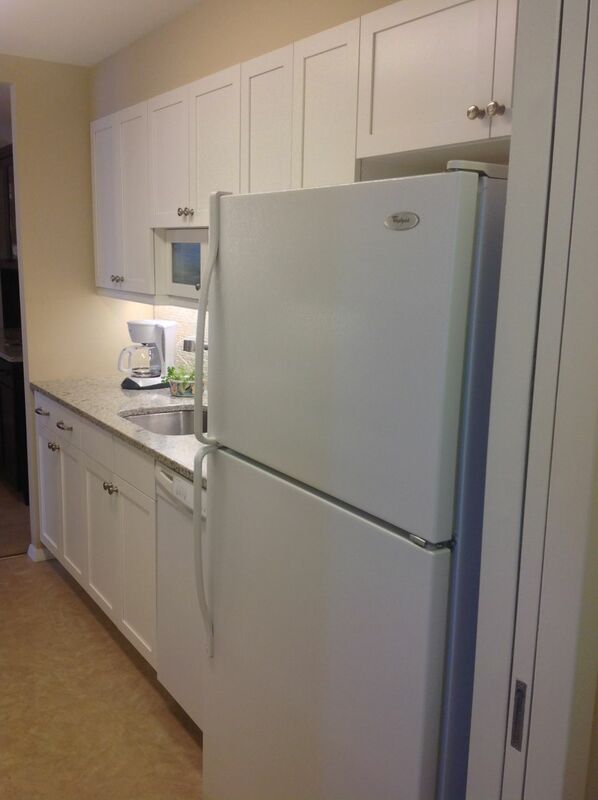 This surface not only looks nice but it is durable to withstand hot materials used in the kitchen as well. • Crown molding and a decorative backsplash add life to the new dining room cabinet – While it was nice to gain storage and counter workspace with the new dining room cabinet – this feature really came to life when the Cleveland Design and Remodeling team recommended to Karen to add crown molding and a decorative tile backsplash. 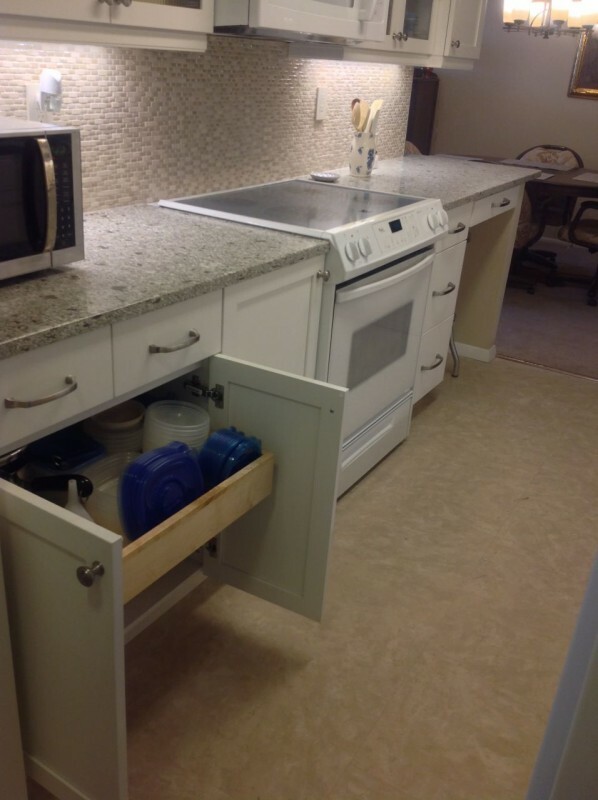 Which of the 3 I’s (ingenuity, improvisation or inspirational products) did you find the most interesting in this Lakewood remodeling project? Comment or call the number below for additional feedback or free design consultation. Cleveland Design and Remodeling at 216-658-1270. 5 Condo Design Ideas for A Space Built Around You!